Bluedog Guitars truly is a candy shop for guitar lovers! 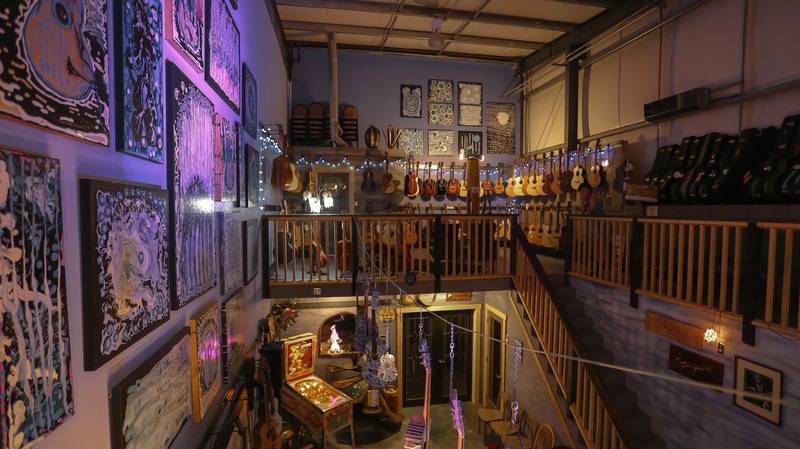 When customers open the door to Bluedog Guitars, they are greeted by a cathedral-like ambience that causes most customers to be awestruck! A cascade of original abstract artwork by the owner Jenn Ladd soars up the 30 foot wall over the heart of the shop, the Bluedog stage. 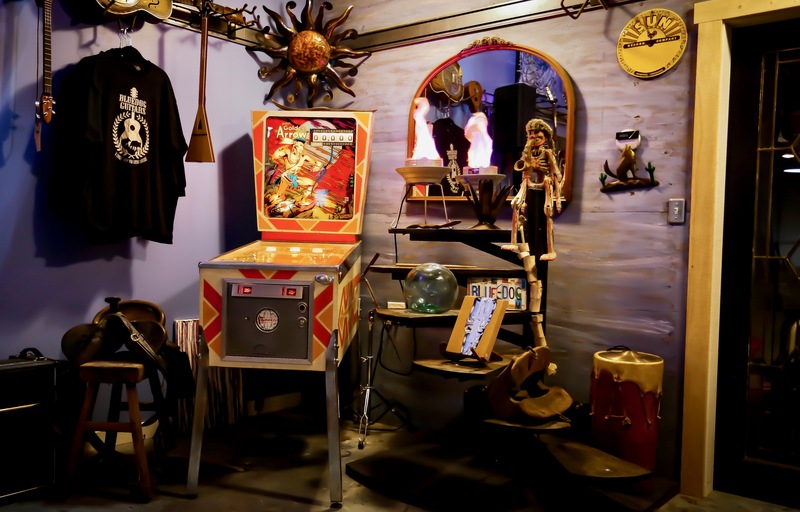 Painted guitars float from the ceiling, a pinball machine entertains accompanying family members, as do comfy glider chairs and a bar area. As a dealer of boutique hand-crafted instruments, Bluedog Guitars provides an environment that showcases the high quality of the products in a space as awe-inspiring as the instruments are themselves. For many people, purchasing an instrument represents a special occasion in their life, and the store experience contributes to that memorable event. 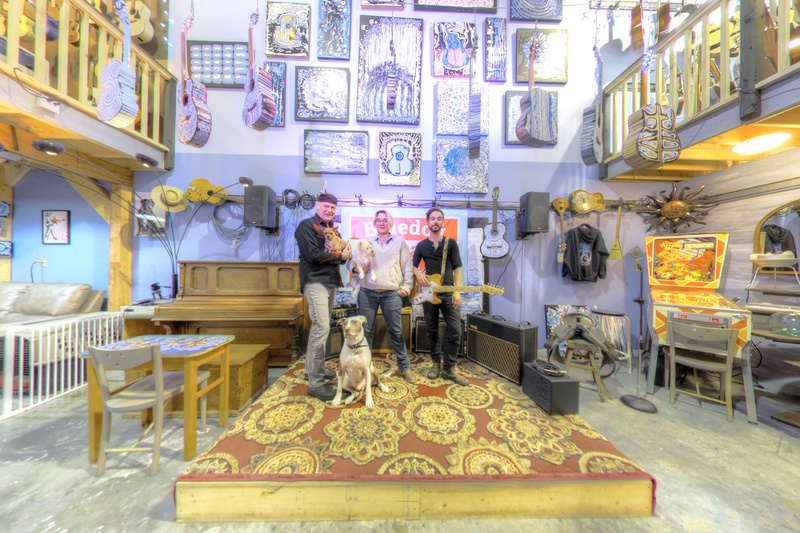 Bluedog is such a welcoming environment that many customers come by the shop just to appreciate the gallery-like atmosphere that the harmony of instruments and artwork provide! 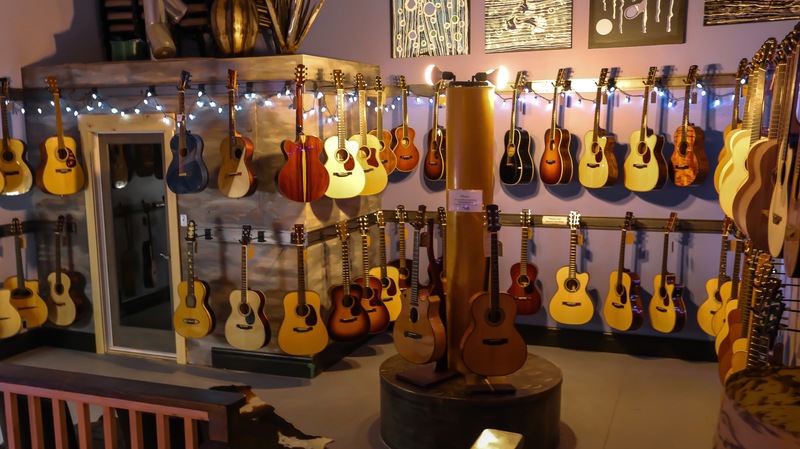 Up an open staircase two floating guitar galleries display a lovingly curated collection of bespoke acoustic and electric guitars, joined by a gangway walled with guitar cases. 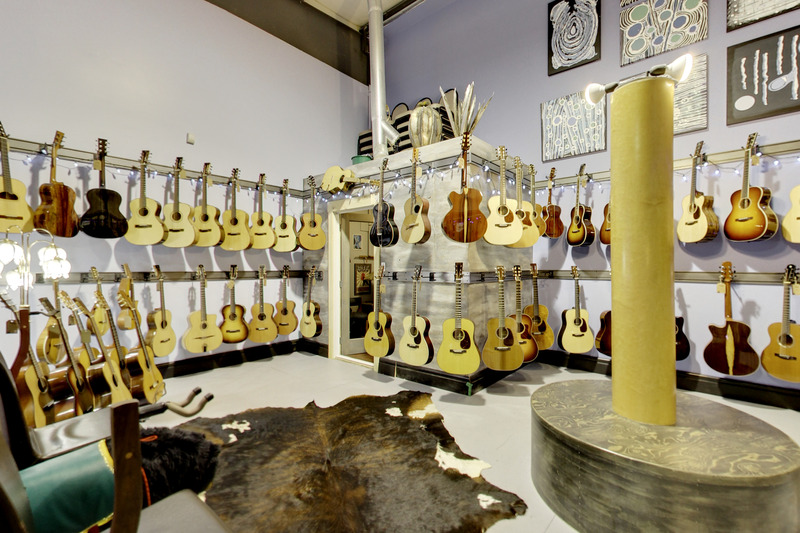 An isolation room provides privacy and is equipped with a sink so customers can wash their hands before playing the guitars. 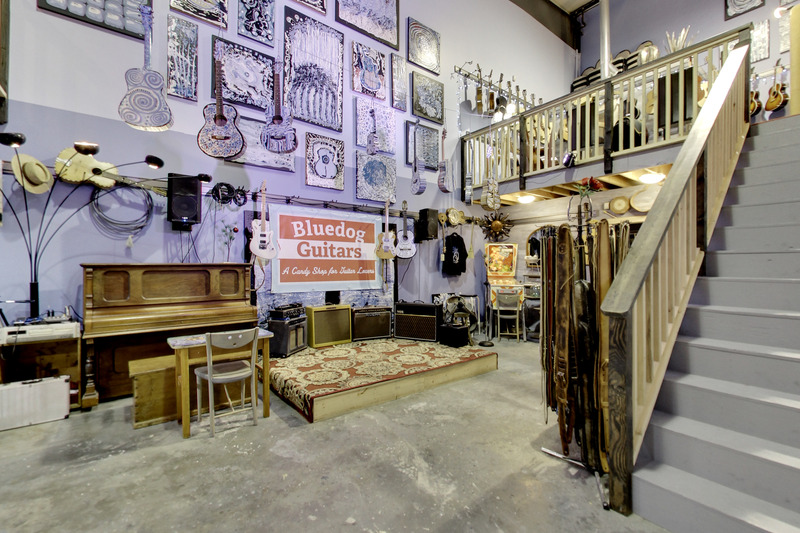 The guitar galleries and gangway double as seating for the concerts, workshops and Open Mics Bluedog regularly hosts. The central presence of the stage flanked by instruments and amplifiers creates the impression that at any moment, a performance could occur (as often happens when great players are in the shop). Bluedog Guitars provides its customers with a very high level of personalized service, reflective of the care taken in the creation of the hand-crafted instruments it sells. Customers are counselled on how to properly humidify and care for their guitar, and case candy includes a Bluedog-branded polishing cloth and/or a Bluedog leather pick-holder key chain and pick. 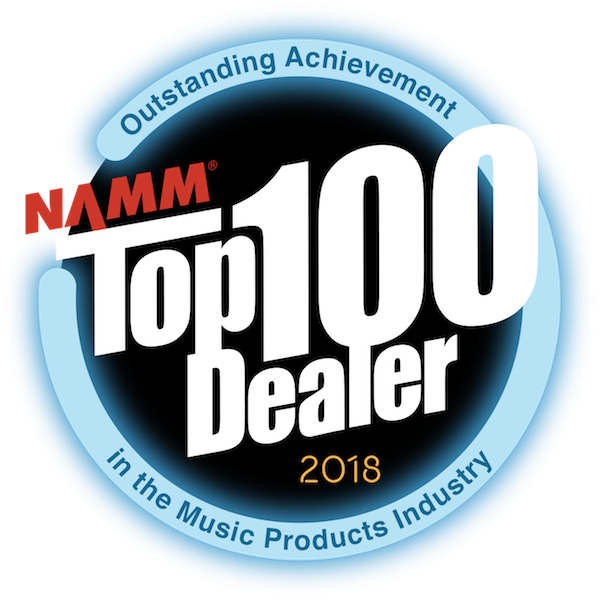 Bluedog also takes the time to teach its customers not just how to choose the right guitar specific to the needs of each individual, but how to change strings or how to use an amplifier or looping pedal. Incorporating a wholistic view that encompasses the guitar community beyond a direct consumer relationship, Bluedog also hosts open mics, presents concerts for touring artists, and provides educational workshops by our luthiers and players that deal with both the mechanics and creativity of playing guitar. Bluedog also caters specifically to the fastest growing community of guitar players: women. Bluedog is owned by Jenn Ladd, who recognizes the importance of ensuring women have access to a guitar retail environment that is inclusive and responsive to women's needs. Bluedog specializes in small-body guitars for beginners through to high-end that are better suited for women, and properly fitting women for a guitar is an integral part of the Bluedog experience. Be it a novice player or an experienced professional, the proper set-up and maintenance of an instrument is crucial in providing the optimal performance during the process of music making - to both enhance enjoyment and inspire. To that end Bluedog employs the best luthiers available to service and repair everything it sells, and most importantly inspect any used or vintage guitars in order to guarantee the customer - particularly if its an online purchase - is getting exactly what they paid for without surprise. This service extends to installing pick-ups and customizing playability to meet precise player requirements, and providing a range of additional options including string choice, amplifiers, microphones, and even high-end guitar pics. 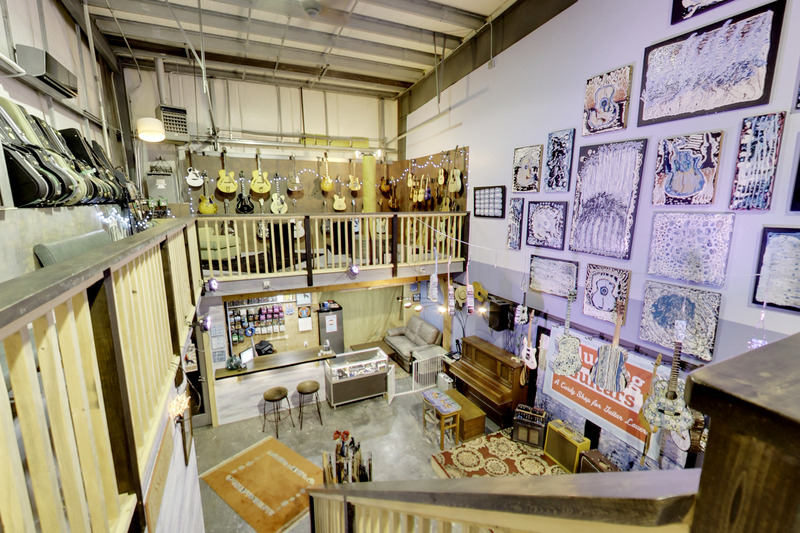 Take A 3D Tour of Bluedog Guitars!